Having some fury friends around in the office might certainly have a number of positives yet at the same time it cannot be denying that there are some drawbacks of this system as well. Over here we will present before not merely the pros and cons of whether having a ‘no pets policy’ in the office is a good thing or not. In addition to this, the topic of whether having animals around in the work place to relieve stress is really effective or not, will also be addressed. So if you are a manager in the office wondering what you should do in this regard, then be sure to continue reading! One of the major advantages of having a pets in office policy is because it serves as a great way of alleviating stress. Stress is something that causes employees to go through a lot of strife not merely physically but also emotionally as well as psychologically. A little ‘petting therapy’ is something which can go a long way in ensuring that your employees are healthy and happy. Sometimes even having the calm reassuring presence of your animal nearby is enough to give employees some confidence and mental strength. If your employees are not united then it is your responsibility to ensure that you get your group together so that they can function as a unit rather than as separate entities. A great way to bring people together is allowing them to bong over the fact that they have a shared love for animals. Things like this help to get the ball rolling and to break the ice so that there is no awkwardness between employees. It is obvious that if someone brings his or her pet to work then a number of people are going to gather around to ask his name or to enquire how old he is. Even small talk like this does serve a purpose to bring strangers together. When you have your pet nearby, then you automatically or rather habitually start talking to him or her and start pouring out your heart. This is something that many pet owners will do and even though their animals cannot answer them back just having vented out whatever is in their mind is bound to make them feel a lot better. If you are a pet owner then you have certainly done this before and sometimes having someone listen to you and offer no response or no judgment is very rewarding. This helps lower the blood pressure of your employees. If you have customer and clients who are pet loves then allowing pets to the office is something that can indeed pay off for you in the long run . You could use these pets as effective marketing strategies to help lighten up the mood of your clients and even put a smile on their face. When clients are happy and without stress then they are more likely to spend some money and make investments, as opposed to if they were in a bad or a grumpy mood. Trying out this policy has a number of pros and this is one of the main ones indeed. As a manager or a boss of a company it is important that you always have the best interests of your employees at heart, so this being stated you should think about what they are going through when they have to leave their pets with a stranger or with someone who might not even take very good care of their pets. For most people pets are also members of the family and leaving them at home alone or with a stranger is just as painful for them as leaving their child in that condition. So if they are bringing their pets to work then they do not have to spend money on sitters nor are constantly worried. If you have your best interest of your company at heart, then think of it this way that most often some sitter takes leave or call in sick, putting your employees in a tough spot. At such a point in time all that they can do is call into the office saying that they will not be able to make it to work that day. So rather than having employees being absent for a reason like this, it is better if you just allow pets in the office as there are obviously so many pros to this policy and it has proved to be affective in a number of top companies where it has been implemented. In the corporate world, time means everything that most employees who hold top positions do not even get the chance to take a proper break during the course of the day. Sitting in front of the computer throughout the day or even being confined to a room or a cabin does not come without its own set of health related complications. At such a time what helps employees get some exercise is having a pet around in the office who will be a source of amusement and will force the employee to get out of his seat at least a couple of times a day. When you have your pet at work then you automatically feel like you have bought a little piece of your home with you. You automatically begin to feel a little more comfortable and you even might deliver better quality work as a result of your mental ease. Having an animal at workplace works wonders for those who are staying away from their home, in a new city. Having such a policy does not come without its draw backs. One of the main ones is that animals tend to make a lot of noise. As fun, as cute or as adorable as they might be they just do not fit into the professional set up and having unwanted noise will just make the atmosphere less conducive for work to take place. So if you have been employed in a company it is your responsibility to ensure that you have some place to keep your pet, it is not the prerogative of the office to take care of your personal problems. One of the biggest disadvantages about having most pets around is that they dirty the surroundings. Not merely do they shed their fur all around the place but they might also leave some of their droppings in the most unlikely area. 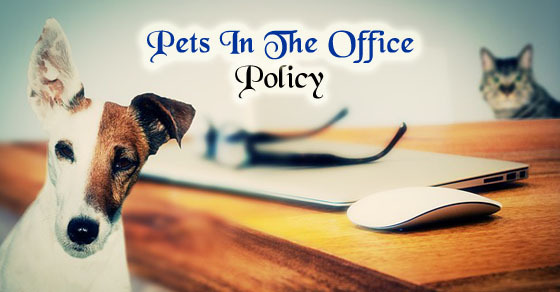 So it is better to not allow pets to the work place considering how chances are that if the employees have to take care of the shedding hair or even the droppings, then they will have to take the time out from their own working hours. So why would any company pay their employees a great deal of money to do work which is not even remotely related to the company. Having many animals around might cause your office to look less like an office and more like a zoo. It is most unbecoming if a big company has a foul smelling all around owing to the pets which have been brought in. Chances are that your office is air conditioned so getting rid of such a stench might not be easy for you and might end up lowering the company name. So if you value the company name, no matter how much you might be loving animals it is advisable to give this policy of bringing pets to the office, a thumbs down. If you are in a company which has spent a great amount of money on décor or has expensive products lying around then it is better that you shy away from introducing this policy. Once some pet has broken a computer, torn up an important paper or spilled ink on some files, and then what can you even do about the matter other than pretending to be okay with it? No matter how much you shout or scream after the mishap has occurred, you cannot reverse the damage and nor will the animal even be able to understand the gravity of the situation which has just transpired. Just because of few people in the company, it certainly does not imply that you have to implement such a kind of policy. Some pets might make other individuals feel ill at ease, severely affecting their performance, or even worse it might put off a number of customers who might be a source of great income to your company. No one should be made to feel uncomfortable in the place which they work as after all not everyone is comfortable with having animals around. If employees get too fond of each other’s pets then this might be a huge source of distraction to the employees where they might neglect their work just so that they might spend a few more minutes with their fury friends. It is not for nothing that dogs are known as man’s best friend. One of the most common pets to have is a dog and most dogs can be trained in order to behave in a disciplined manner when they have been brought to the office. So if the dog is trained to behave well and not excrete in the wrong place then they could indeed be a delight to have in the office. Though many pet owners might have no qualms about leaving this pet at home, yet being able to bring this pet to work does have a number of positive influences, primarily because simply watching a fish glide in its little bowl is very relaxing indeed as it transports you away from your busy world to the world of the fish. Fish do not need to be fed much, nor do they create a noise or leave their droppings, thereby making them ideal to have at the office. Cats are also a popular pick for many as this is one animal which is unlikely to make a noise or to misbehave. Cats can go on for hours being unnoticed and it is unlikely that they will do things to seek your attention. Their quiet unassuming presence makes them ideal to have around the office. Though this might seem like a very unlikely pick, but there are many people across the globe, that do have pet turtles who they derive a great amount of comfort from. Turtles are those animals which won’t even make a noise and nor will it distract you by constantly running or jumping around. It is only after careful thinking that you should decide on what conclusion you ought to come to. You must ensure that you do not take the decision based on your own likes and dislikes rather you take into account how comfortable everyone in the office is with having pets around. This is no small decision, so ensure that you do take your time to decide and at all costs ensure that you do not narrow down on any animal which makes too much of a mess or even makes too much of a noise as it could ruin the work atmosphere. Next articleWhat is the Importance of Body Language during Interview?